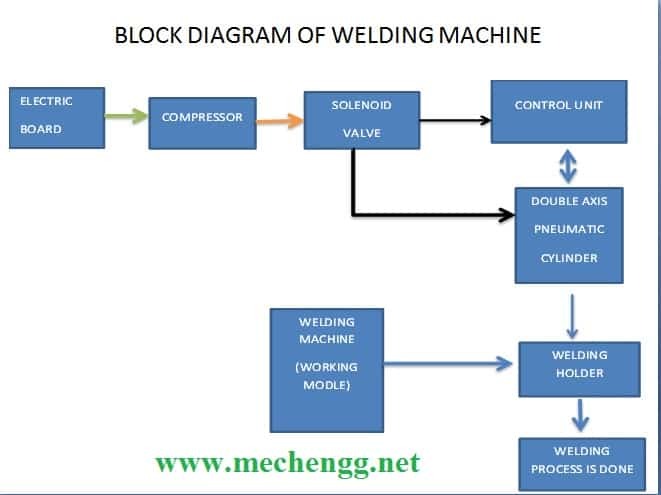 In our project “AUTOMATIC DOUBLE AXIS WELDING MACHINE” is beings with introduction to welding the various components automatically. Single -pneumatic cylinder and Solenoid valve are provided.Cylinder is used for the forward and backward movement, it moves x and y axis that’s why called double axis welding machine. The Double axis welding machine makes use of properly shaped MS alloy electrodes in order to apply pneumatic pressure and carry electrical current through the workpieces. Heat is generated mainly at the merging point between two sheets. This causes the material being welded to melt gradually, thereby forming a molten bath, known as the weld mass. The molten bath is held through the pressure applied by the electrode tip and the encircling solid metal. If the compressed air goes to solenoid valve to pneumatic cylinder. welding holder connected to pneumatic cylinder which actuated by solenoid valve at the time automated welded for metal.